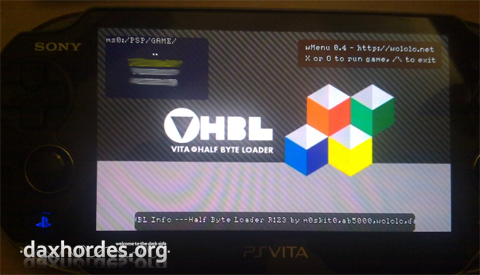 Our friend website daxhordes.org got an early copy of VHBL and confirmed for me that VHBL works fine with the EU version of the exploit on a European PS Vita. (For those who worry that this is a fake or a leak, that copy of VHBL was sent by me to m0skit0, and I agreed that daxhordes could publish an article and photos on the subject). Here are the screenshots, which also reveal the cool new wMenu/VHBL background (thanks to Monsieur2T2R for these great designs).